The freeze drying community has dedicated resources for artificially inducing nucleation since it was introduced to the community as a means for reliable prediction of product stability, scale-up and primary drying time reduction. Broadly, there are at least 5 known techniques for artificially inducing nucleation with the same basic characteristics. However, few studies have tested these processes at large scales of operation (>35 m² shelf area, 150,000 vials) uniformly. 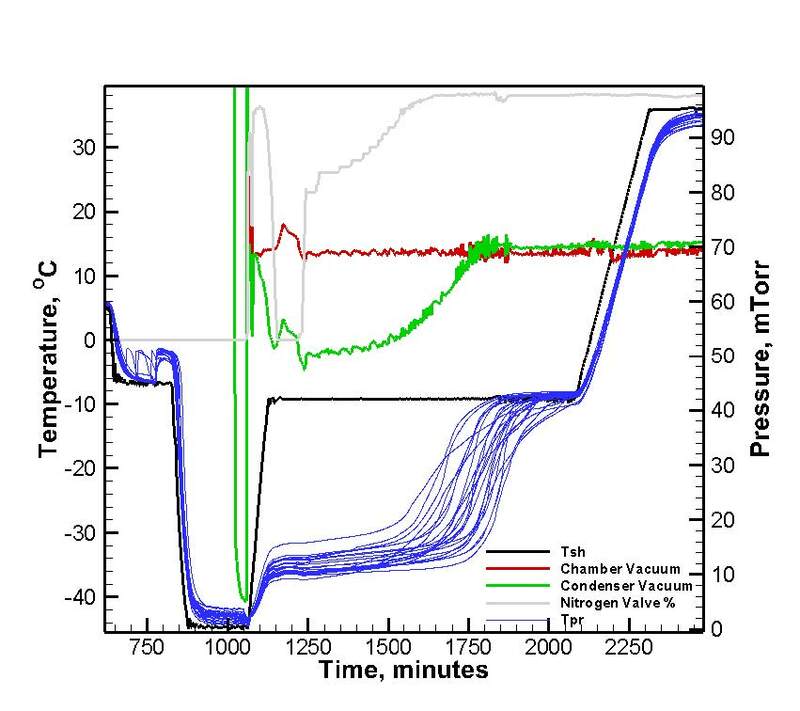 This report herein describes the first known attempt at quantifying the success of such processes in inducing nucleation on a 56m2 freeze dryer operating at a load of 195,960 vials. It is found that thermal gradients within freeze dryer chambers typical of the production environment should be considered when designing the scale up of the freezing process in lyophilization. Freezing, primary drying and secondary drying are three mains steps of the freeze drying process. While primary and secondary drying steps of freeze drying process for the most part are well controlled, the freezing step remained largely uncontrolled until recently. Although there are currently a slew of nucleation technologies to choose from, there is little or no data to prove scalability of these technologies in large freeze-dryers, especially those on production scale. The overall efficiency and consistency of the lyophilization process, as well as the reliable prediction of product quality, largely depends on the nucleation temperature. Furthermore, having a reliable method to induce nucleation in production freeze dryers simplifies the scale-up of processes developed at lab scale. The temperature difference between the equilibrium freezing point and the ice nucleation point is known as super-cooling. Lower nucleation temperatures result in more ice-nuclei across the ice frozen matrix with smaller crystals. These smaller ice crystals leave behind smaller pores as the product dries creating a high specific surface area within the product which presents a greater resistance to sublimation and resulting in a longer primary drying period. This is undesirable as the primary drying step of the freeze drying process is quite often the rate limiting step in the drying process. The product may also visually appear to be inconsistent across the batch and thus, reconstituting differently. For this reason it is beneficial to narrow the range of product temperature at which nucleation can be induced across the product batch. By contrast, a higher nucleation temperature or a lower degree of super-cooling, results in fewer ice-nuclei and larger ice crystals forming pores. Larger pores enable higher sublimation rates, hence resulting in shorter primary drying cycles, as well as reduced reconstitution times and potentially improved finished product attributes. It is also important that all vials nucleate at or near the same temperature to ensure consistency of the product morphology, resultant cake structure and appearance, with better overall product uniformity. Induced nucleation methods offer many benefits to freeze-dried products including: increased vial-to-vial uniformity, reduced cycle times, reduced protein aggregation and better conformance to the FDA’s Guidance for Industry Q10 Pharmaceutical Quality System Sec 3.2.1 which states that pharmaceutical manufacturers are expected to “Identify sources of variation affecting process performance and product quality for potential continual improvement activities to reduce or control variation.” Therefore it is of great importance that we have nucleation methods that perform well not only at lab scale but also in large manufacturing setups. The current work presents some of the latest developments in inducing nucleation in large manufacturing freeze dryers (>35 m² shelf area). Ice fog nucleation is the process by which ice crystals are introduced into the chamber during the freezing step to provide nucleation sites for all of the vials in a batch . This results in all of the vials nucleating at the same temperature, thereby improving homogeneity of the ice crystal structure and dried product characteristics across the batch. For example, artificially inducing nucleation has shown evidence of decreased primary drying times, lower residual moisture contents, and improved homogeneity The VERISEQ® Nucleation system (a technology jointly developed by IMA and Linde gasses) induces product nucleation through a process that is retrofittable to most freeze dryers. Before the ice fog is introduced, the product is first stabilized at a predetermined temperature for a given until all of the vials have reached the desired nucleation temperature. This is performed by using an appropriate shelf temperature, usually 1-2 °C colder than the desired product temperature time (example 90 minutes at a shelf temperature of -5 °C to have a product temperature of -3 °C). The product temperature required for inducing nucleation varies based on product concentration and composition, fill height, and freeze dryer size. Once the temperature is reached, the product chamber is evacuated to 20% to 50% of atmospheric pressure, using the existing vacuum system on the freeze dryer. The VERISEQ® Nucleation system generates an ice fog by mixing sterile liquid nitrogen and steam through a specialized ejector. The chamber equilibrates to atmospheric pressure during the introduction of the ice fog. All of the vials nucleate at a similar temperature (within 0.5 °C in most cases), and the freezing process continues. While there are various methods to induce nucleation in smaller freeze dryers, few if any have been tested on production scale freeze dryers. This work describes the challenges associated with inducing nucleation on production scale freeze dryers, and highlights our findings in using the VERISEQ® Nucleation method to successfully nucleate 195,960 vials on a 56m2 freeze dryer, believed to be among the largest freeze dryers in operation in the pharmaceutical industry. Traditionally, it was believed that the greatest challenge of the ice fog technique is in ability to successfully scale up to production scale freeze dryers due to the thermal gradient within a freeze dryer. 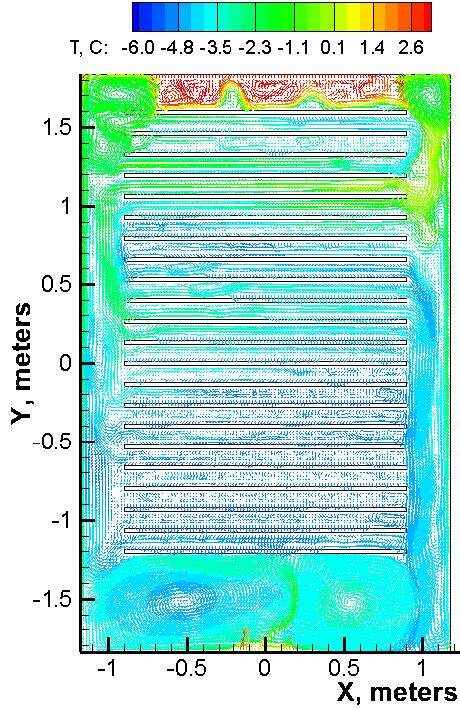 Coupled fluid thermal models were used to compute the thermal gradients for a 56 m² shelf area freeze dryer. It was found that in the region covered by the vial pack, the largest gradient could be as large as 2 °C as shown in figure 1. This thermal gradient provides the first challenge associated with the ice fog method on production scale freeze dryers. To better understand the effect of the thermal gradient within a freeze dryer, a study was conducted to determine the variables that could be adjusted when scaling to production scale freeze dryers. In this study, a VERISEQ® Nucleation system was connected to an IMA Life LyoMax 15 freeze dryer with one 2” port on top of the freeze dryer used as the inlet for ice fog, and a single 2” port located on the mechanical space door for the outlet. The locations of the inlet and outlet ports were chosen due to the expected buoyant forces during typical freezing cycles in a freeze dryer. Clusters of 10 cc Schott tubing vials (Lebanon, PA) with 3mL of a 3% w/w mannitol solution with one internal and one external thermocouple (thermocouples taped to the side of the vial) were placed throughout the top, middle, and bottom shelves within the freeze dryer. Internal thermocouples were used to monitor the product temperature, while external thermocouples were used to monitor product nucleation without providing a nucleation site. The wall temperature was also monitored with a thermocouple to monitor the effects of radiation from the walls. First, the product vials were allowed to equilibrate at -6 °C for 90 minutes before proceeding with the introduction of the ice fog. After stabilization, ice fog was injected into the product chamber to observe the effect of the thermal gradient. As anticipated from the computational models, vials on the top shelf directly facing the door did not nucleate due to the increased effects of radiation from the walls. NOTE: the thermal gradient is from top to bottom. In the following test, product vials were allowed to equilibrate at -6 °C for 90 minutes with the walls cooled to 10 °C (compared to 16 °C in previous test). After the 90 minute stabilization period, ice fog was injected into the product chamber with all vials successfully nucleating during the ice fog injection phase. Figure 2 provides a summary of the optimization study. The study proved that successfully inducing nucleation at production scales may require a reduction of the existing thermal gradients. The following section discusses results from a 39m2 shelf area freeze dryer. Given that the thermal gradient of the wall temperature (and thus the radiation from the walls) plays a critical role in the success of artificially inducing nucleation, the next test focused on finding a means to mitigate the thermal gradients on a 39 m2 freeze dryer. In this study, a VERISEQ® Nucleation system was connected to the freeze dryer with one 2” port on top of the freeze dryer that was used as the inlet for ice fog, with a single 3” port located on the mechanical space door that was used as the outlet. In an ideal scenario, 3” ports are recommended to promote recirculation through the ice fog ejector. A total of 45,540 vials were placed on the top, middle, and bottom shelves of the freeze dryer. 29,700 vials contained the standard concentration of product used by the client, while 15,840 vials contained 20x the concentration in a larger vial, 3 mL and 60 mL vials, respectively. Both, internal and external thermocouples were used throughout the batch. Vials were manually loaded, with the shelf temperature set at 2 °C during the loading phase. The shelf temperature was then set to -7 °C and after an initial equilibration period of approximately 90 minutes, the chamber was evacuated to a reduced pressure, and ice fog was introduced. Figure 3a presents a comparison of thermocouple data with and without VERISEQ® nucleation. As expected, the use of induced nucleation provides a reduction of nucleation time and nucleation temperature range from 152 minutes to <2 minutes and from 9 °C to 0.8 °C. This reduction in nucleation temperature range results in increased homogeneity throughout the product batch. Figure 3b provides a comparison between identical freeze drying cycles, with the only change being the use of the VERISEQ® Nucleation method. By using VERISEQ® Nucleation, the time that primary drying begins to slow down as indicated by the nitrogen bleed valve opening occurs 12.4 hours earlier. The end of primary drying occurs 5.4 hours earlier as indicated by the reduction in Pirani data for chamber pressure. It is important to note that these results can give opportunity to further optimize the freeze drying cycle (example increase shelf temperature using ice fog with an expected reduction in product resistance), which could potentially reduce primary drying time further. Although processing conditions such as loading temperature can be favorable to promote successful ice fog injection, some products may be too restrictive to cycle changes. The objective of this test was to determine if the freeze dryer jacket could be cooled during the loading phase to reduce the thermal gradient during the freezing phase, as well as prove the scalability of the VERISEQ® Nucleation system to such large systems, believed to be among the largest freeze dryers in operation today in the pharmaceutical industry. In this study, the nucleation system was connected to an IMA Life LYOMAX 56 with one 3” port on top of the freeze dryer that was used as the inlet for ice fog, with a single 3” port as the outlet. The LYOMAX 56 was fully loaded with 195,960 3cc vials with a 1.2mL fill. Internal and external thermocouples were placed near the top, middle, and bottom shelves of the freeze dryer. Vials were loaded using the client’s automated loading system. The loading shelf temperature set at 5 °C. During the loading and freezing ramps, the jacket of the freeze dryer was cooled with the silicone oil used to maintain the temperature of the shelves. After loading, the shelf temperature was held at -7 °C for about 90 minutes at which point, the chamber was evacuated to a reduced pressure, and ice fog introduced. Figure 4 provides the cycle data during the ice fog injection phase. By using artificially induced nucleation, the primary drying duration (as indicated by the time the last thermocouple reaches the shelf temperature) is reduced by 19%. While the overall cycle time did increase from 1514 minutes to 1854 minutes (since the original cycle cold loaded the product on -40 °C shelves), it is critical to note that the cycle can be optimized (for example, by increasing shelf temperature since the product resistance is expected to have reduced), which may reduce overall cycle time. While there are several known techniques to artificially induce nucleation with the same basic characteristics, few studies have tested these processes at large scales of operation (> 35 m² shelf area, >150,000 vials). The data presented here has shown that to successfully induce nucleation at such large scales of operation, the existing thermal gradients within the freeze dryers need to be minimized. While some dryers/ product combinations can withstand cooler loading temperatures to help in this, others may require the jacket of the freeze dryer to be cooled along with the shelves during the freezing stage. This was demonstrated at full scale on 2 different freeze dryers, a) 39 m2 shelf area freeze dryer with a product load of 45,540 vials and b) on a 56 m2 shelf area freeze dryer with a load of 195,960 vials. While the former was tested successfully with a cooler shelf loading temperature of 2 °C, the latter required jacket wall cooling to successfully induce nucleation across the batch. Further, inducing nucleation at warmer temperatures reduced primary drying times of the product by up to 19% with an improvement of batch homogeneity up to 40%. The VERISEQ® Nucleation system has proved that it is capable of generating an ice fog distribution that is robust up to a 56 m² shelf area freeze dryer with a load of 195,960 vials, believed to be among the largest freeze dryers in operation today in the pharmaceutical community.